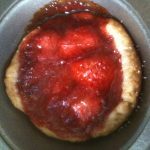 FridgeAndPantry.com Cooking Blog | What's in your fridge and pantry? 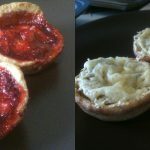 This video recipe is a variation on the Mini Quiches and Cherry Tarts from the previous post. 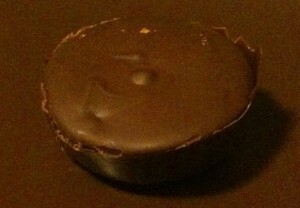 The caramel sauce in this version was slightly chewier than desired, but the flavor was great. The next batch, not in the video, contained diced apples. Additionally, skipping the sauteing of the apples and sauce in the skillet and just cooking in the pie crusts proved much easier and even more delicious. The walnut and sugar topping were a great addition. Today’s cafe style lunch came together very quickly, and was one of the most delicious and satisfying lunches I’ve had in weeks. 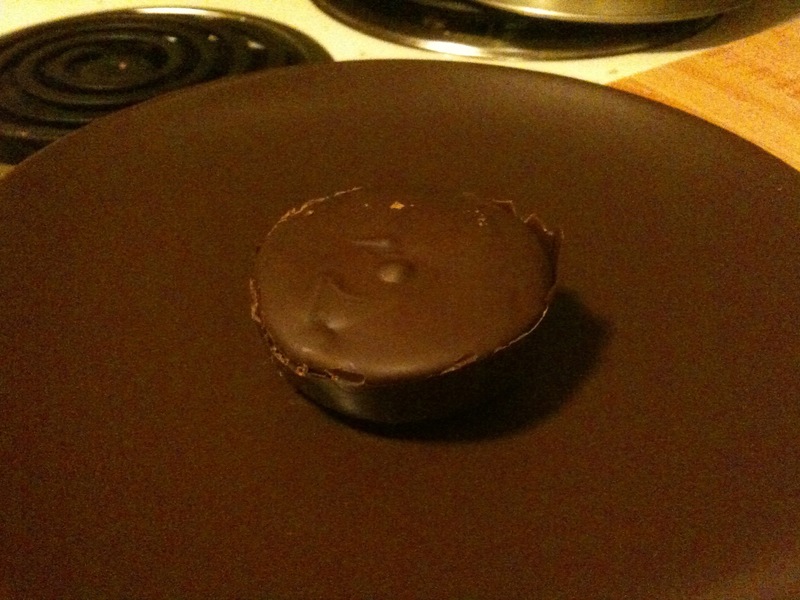 I initially planned to use the half pie crust, or pate brisee for a variation on peanut butter cups, but it was lunch time and I needed a more complete meal. 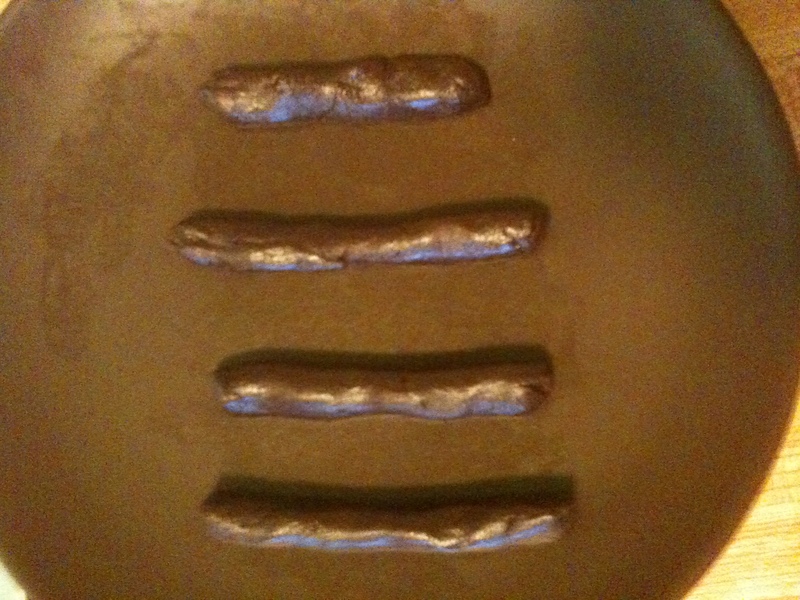 Eating all 6 was a little too much, perhaps 4 or 5 would have been a more appropriate sized meal. 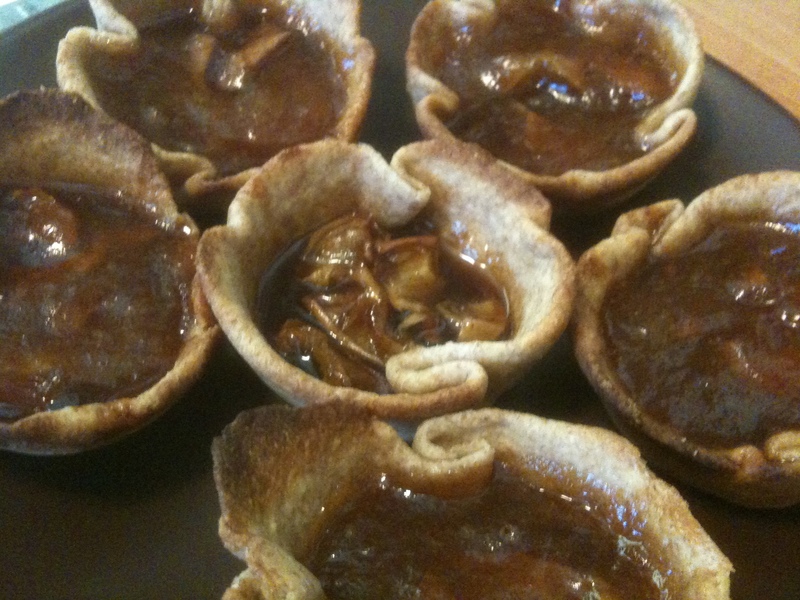 I first mixed the pie crust in a 2 cup Pyrex measuring cup, then divided into 6 small balls. I flattened the balls into circles with the bottom of the measuring cup, them spread and flattened them further with the sides of the measuring cup. 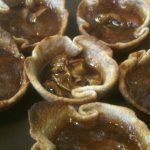 Oil the pan and place each mini pie shell in a muffin cup. Gently press the center down into the cup, and push the edges in place along the walls of the cup. Refrigerate while making the filling. 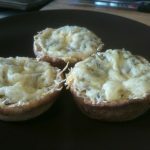 To fill 3 cupcake sized mini quiches, it only requires 1 egg, some milk, salt, pepper and nutmeg. 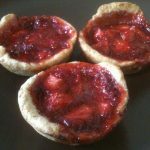 It seemed easier to spoon the filling into the crusts without making a mess, pouring only the last of the filling out of the measuring cup. 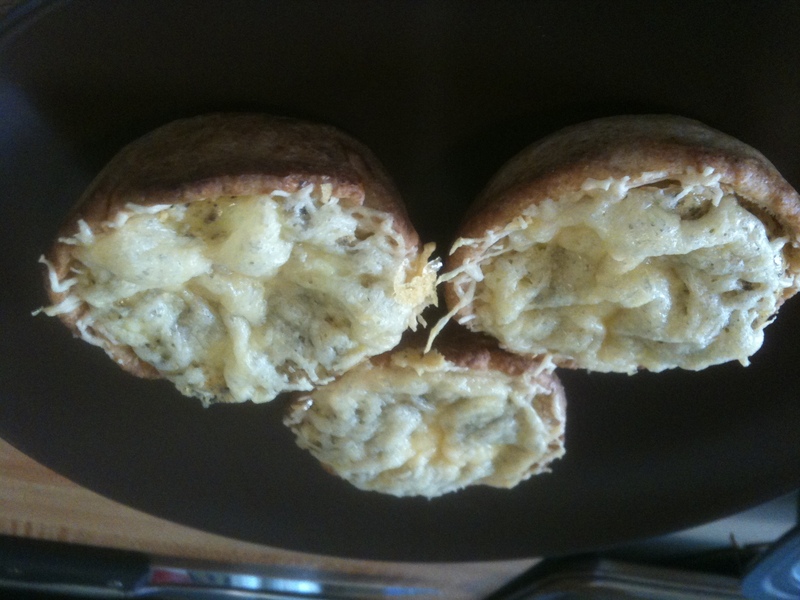 3 minutes before baking was complete, I topped the mini quiches with grated Reggiano cheese. 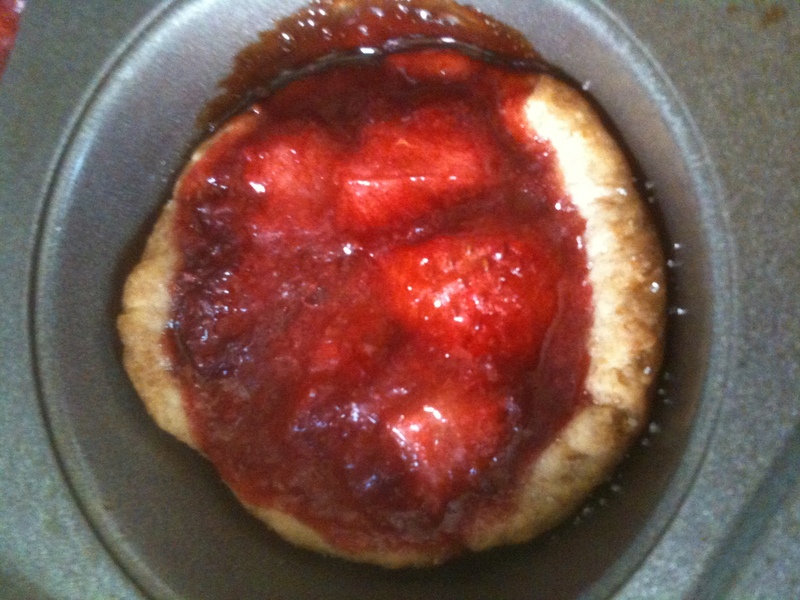 The strawberry filling consisted of partially thawed frozen strawberries, sugar and corn syrup. There was enough water from rinsing and continual thawing to dissolve the sugar. After the strawberries are rinsed with water or microwaved 30 seconds in water, you should be able to break them in halves and quarters with a spoon. 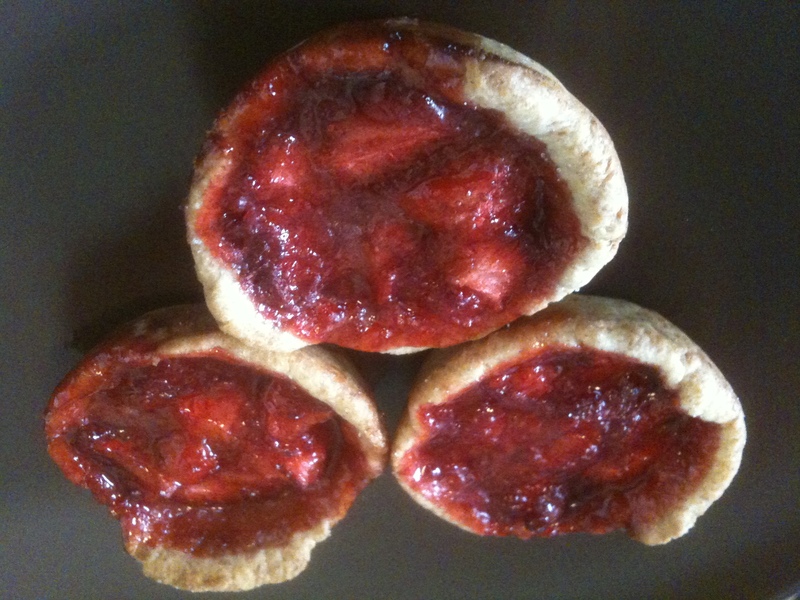 Near the end of baking, when I added the cheese to the quiches, I sprinkled a layer of white sugar over the tarts. One undesirable side effect of cooking often is the need to clean. I prefer to use all natural and animal safe cleaning products throughout the household. For cleaning in the kitchen, I have stumbled upon a few essential cleaning tools. 3% hydrogen peroxide (H2O2) is a great all natural kitchen cleaner. Mix in a spray bottle with half water and hydrogen peroxide to spray on surfaces: counter tops, sink, the fridge. H2O2 must be given a few minutes to evaporate for the sanitizing effect to take place. When H2O2 breaks down, it becomes hydrogen and water, so very safe for the kitchen and entire household. Don’t spray on wood surfaces without wiping quickly, or the high water content may leave marks and cause warping. Vinegar is a strong natural cleaner, also used in cooking. Coffee brewer manufacturers specify running a cycle of 10% vinegar and 90% water to clean the build up from the water supply. 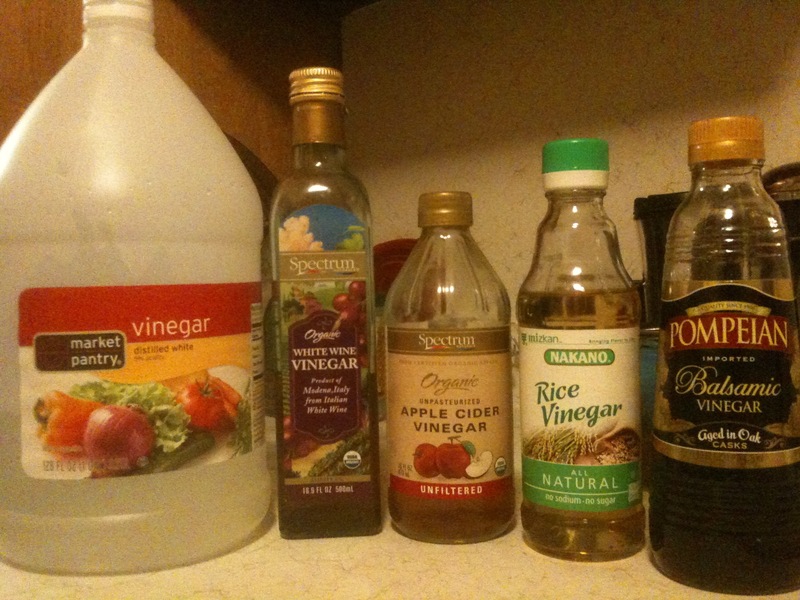 Vinegar can clean off the gunk around and behind the sink edges, when scouring with a pad. Vinegar can also clean up after pets, removing the smell of markings, preventing return engagements. Many vinegars are a by product of the production of wine. Distilled white vinegar, the clearest and “cleanest”, is best for cleaning. It also tends to be cheaper and sold in larger quantities. 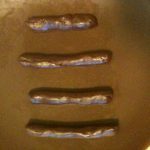 Vegetable oil is often the cause of messes. However, sticky kitchen messes that contain oil soluble particles instead of water can actually be loosened, absorbed or removed with cooking oil. Any remaining vegetable oil can be washed away with dish soap. Steel wool is necessary for those built up and burnt up chunks in skillets, baking pans and broiling pans. Sometimes the grocery stores will only stock the variety comes in a box and has soap mixed in with each little steel wool pad. If these sit next to the sink and stay wet, they will rust quickly. 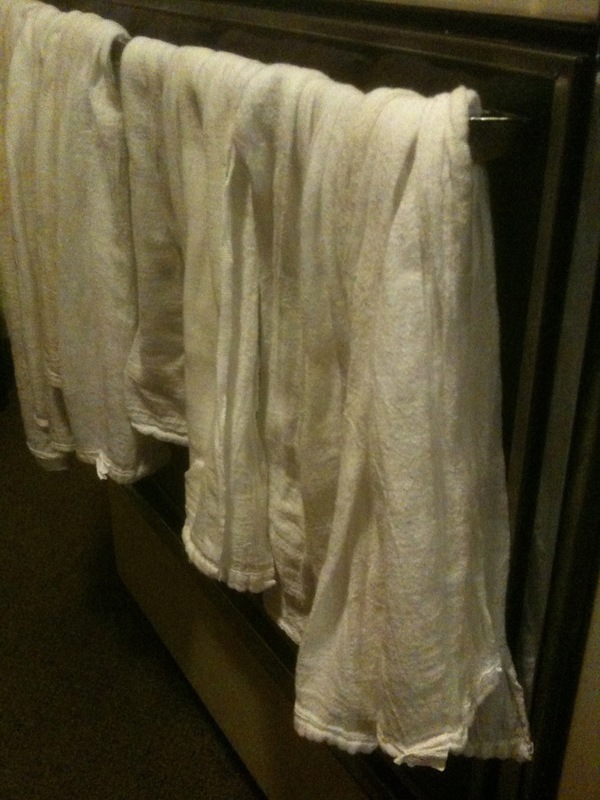 Flour sack towels are (or at least were) a by product of flour production. The great feature of flour sack cloths is that they are lint free when you purchase them. These towels, among other things, are useful for wiping up spills, drying dishes and covering food items. 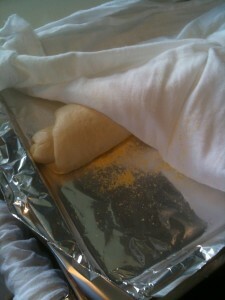 When waiting on dough to rise, the flour sack cloths are perfect to dampen and cover the dough, allowing enough air through, yet holding in warmth and keeping out dust and dirt. If placing freshly baked rolls or biscuits in a bowl or basket, the flour sack cloth can help hold in some warmth until serving. Additionally, if you are mixing large quantities of flour or other dusty ingredients, the flour sack towel will serve as dust guard to cover your mouth and nose, when folded in a triangle and tied around your head like a bandana. 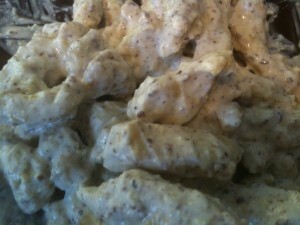 Mayonnaise is a great binder and flavor enhancer for salads, sauces and sandwiches. However, it is nice to have a substitute for mayonnaise at times. It can be high in cholesterol and sometimes just seems gross. 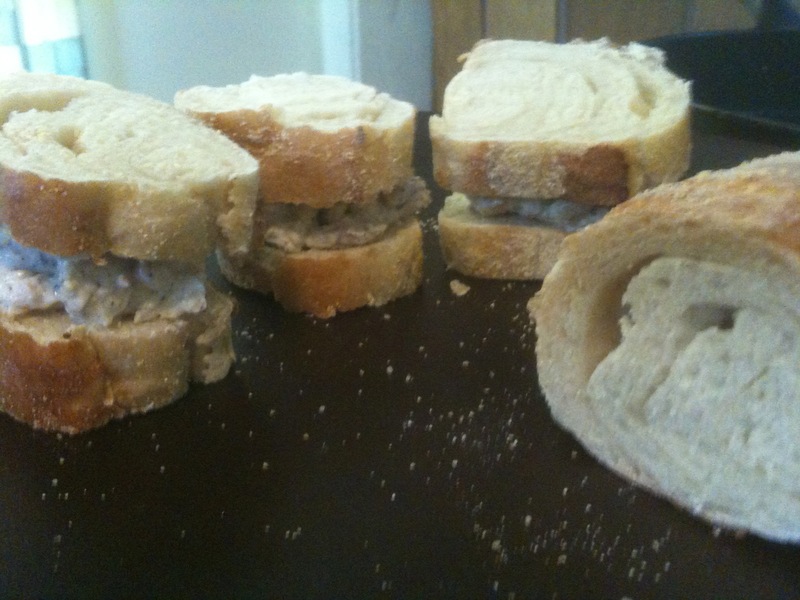 Here are some mini-sandwiches of fresh baked Honey Glazed French bread, with an exotic chicken salad made from leftover chicken shawarma and fresh tzatziki sauce. One day while shopping at Natural Grocer’s, I discovered organic blue cornmeal at a decent price. I grabbed the bag planning on making corn tortillas, but unexpectedly found some great recipes for baking with the blue cornmeal. 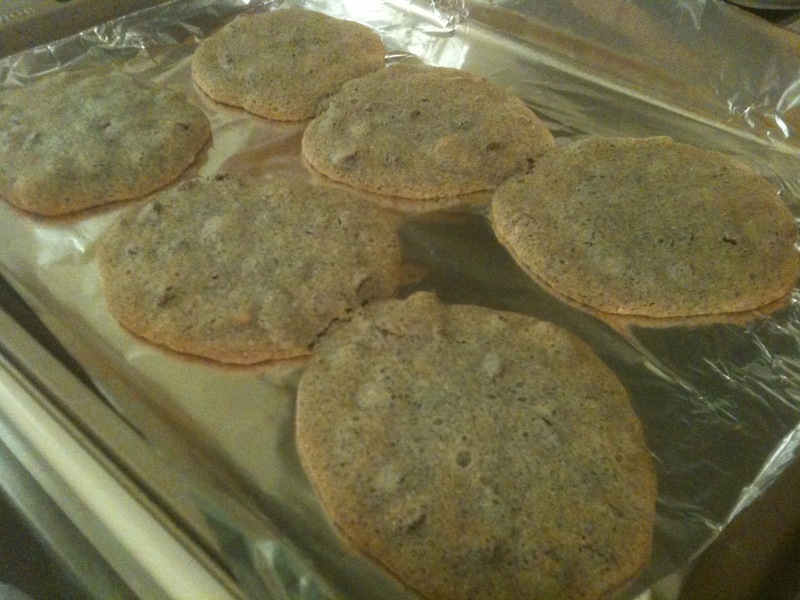 One of my favorites was the Blue Cornmeal Pancakes recipe. When baking with blue cornmeal and combining the cornmeal with liquid, the dough or batter will mix more evenly with warmer ingredients. 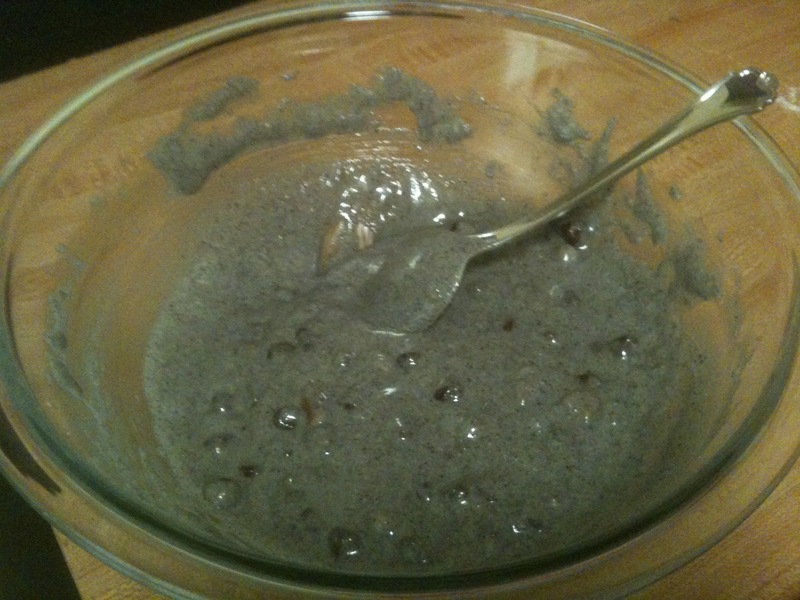 Blue cornmeal is made from blue corn, a variety that was a staple to the Hopi tribe, Native Americans inhabiting modern day Northern Mexico and the Southern United States. The blue cornmeal was used to make piki, the Hopi’s tortilla covered with squash and sunflower seeds. 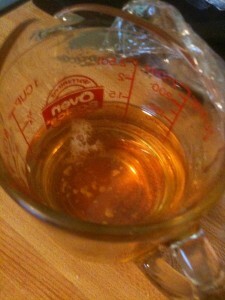 Caramel syrup is thin and runny (like maple syrup), translucent and contains little to no cream. Caramel sauce is usually thick and gooey, opaque and contains cream and butter. I took a caramel sauce recipe, and instead of adding cream at the required stage, I substituted water. 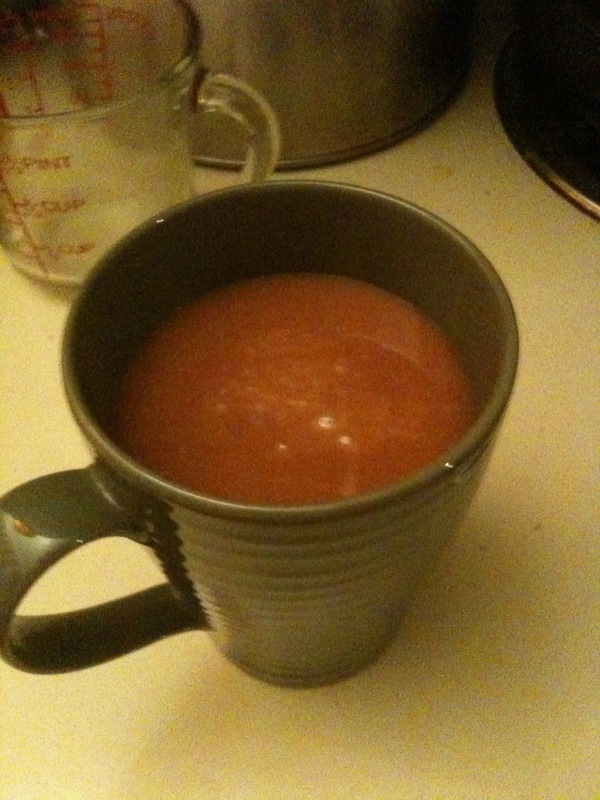 The result was a more pourable and more easily mixable in liquids not piping hot. While the flavor of the syrup is still quite strong and heavy on the stomach, the caramel sauce can be eaten by the spoonful on it’s own. Honey is a somewhat magical natural substance, produced by the ever more scarce honey bee. 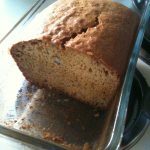 Honey can often be substituted for sugar in baking, presenting a healthier alternative to satisfy those post dinner cravings for sweets. Honey is also used in skin products, known for, among other things, antibacterial qualities. Keep the old small bottle and refill with the larger containers. 3-5 seconds in the microwave will loosen the honey on the bottom. When baking with honey, it’s best to keep the temperature lower, around 325-335 degrees Farenheit. 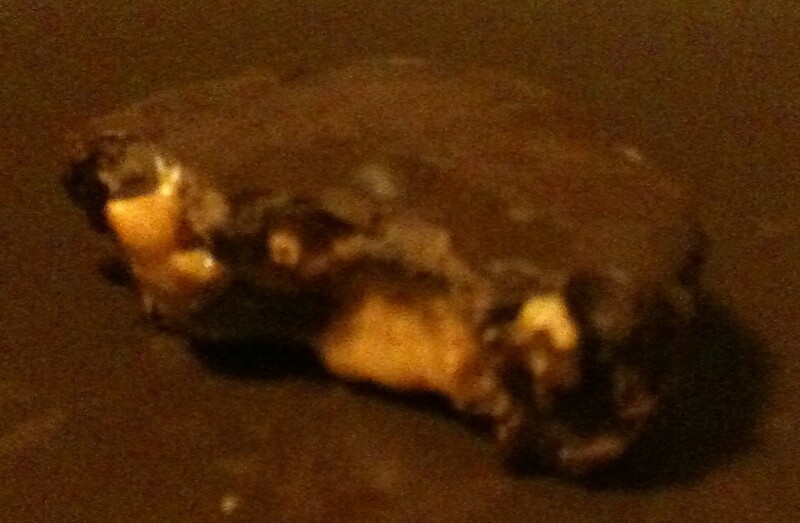 In my opinion, burnt honey is a rather unpleasant smell, and could taint the flavor of a great batch of cookies. 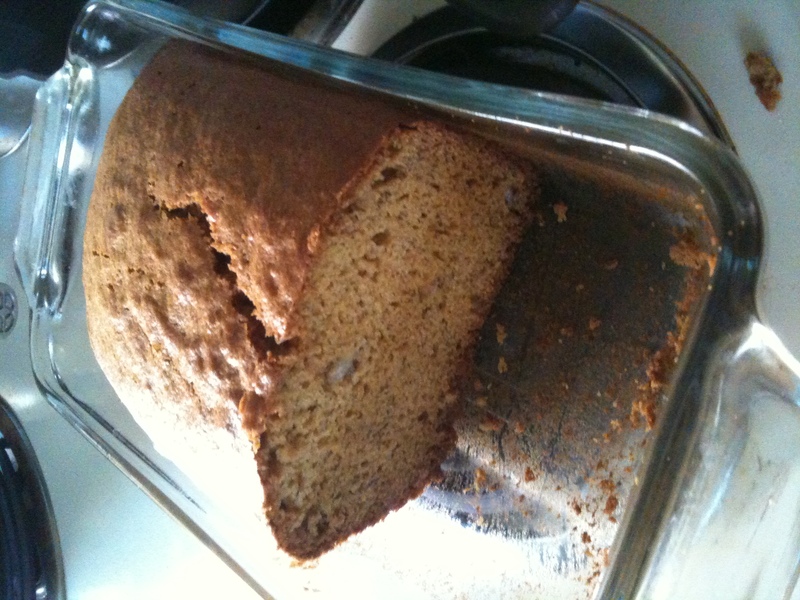 Honey also tends to aid in the rising or leavening of baked goods. Cookies puff the most noticeably, but cakes and breads may also require you to reduce other leavening agents or eggs in the recipe. Honey is also sweeter than sugar, so when replacing sugar in a recipe reduce the amount. You can sometimes get away with half the amount of honey as sugar, but I generally prefer 60-80%, depending on the recipe. 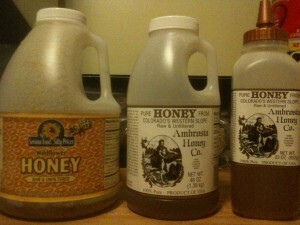 Honey complements some flavors, but can clash with others, so testing before the big part may be best. Sometimes it is desirable to add a high amount of fat to your diet. Here are a few recipes that have high amounts of either vegetable oil or butter.